Posted on September 23, 2016 by Mike Sonnenberg Posted in Cemetery, Haunted Places	. 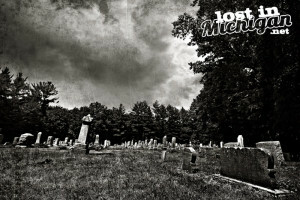 In the north west corner of Saginaw county, north of Hemlock, there is an urban legend of a girl that haunts Dice Road Cemetery, like many urban legends, I think there is some truth that started the story. As the story goes, 5 year old Anna Rhodes Fazio was living in Italy in 1816 with her family, when her father went insane, and set their house on fire, killing himself and her mother. Young Anna survived the fire, and sailed to America, and lived with her aunt in the area north of Hemlock. They became friends with the local Indians. Anna and a young Indian boy named Dark Hawk grew up together. As Anna grew older she fell in love with Jonathan Millerton, and they were married, by the time Anna was 17. shortly after they two wed, Anna’s aunt died, and Jonathan had to sail the Great Lakes for his lumbering pursuits, leaving Anna alone. Dark Hawk became jealous of Jonathan, and began to sexually assault Anna, driving her into insanity. That summer a large storm swept across the state, and when Jonathan’s ship did not return she, feared him dead and committed suicide. Even more tragic, Jonathan returned home after she died, his ship sailed to a few other ports and delayed his return.